A while back I looked into whether or not SPList.ParentWeb really needs to be disposed: Is SPList.ParentWeb a Leak? The specific motivation was to investigate why SPList.BreakRoleInheritance() requires Dispose() on ParentWeb property, as seen in Roger’s Dispose Patterns by Example. I stand by my original conclusion that this advice generally does more harm than good, but thought it would be useful to discuss in a bit more detail. In the vast majority of cases, the URLs will match and return the parent collection’s Web, which should not be disposed (unless, of course, you own it and know it is ready for disposal). Only in the exceptional case that the list’s ParentWebUrl indicates it doesn’t live with its parent collection will a new SPWeb be created. I believe it is this exception, rather than the norm, that leads to Roger’s suggestion that ParentWeb should be disposed. I could show several more obscure code paths with the same result, but the specifics are irrelevant. 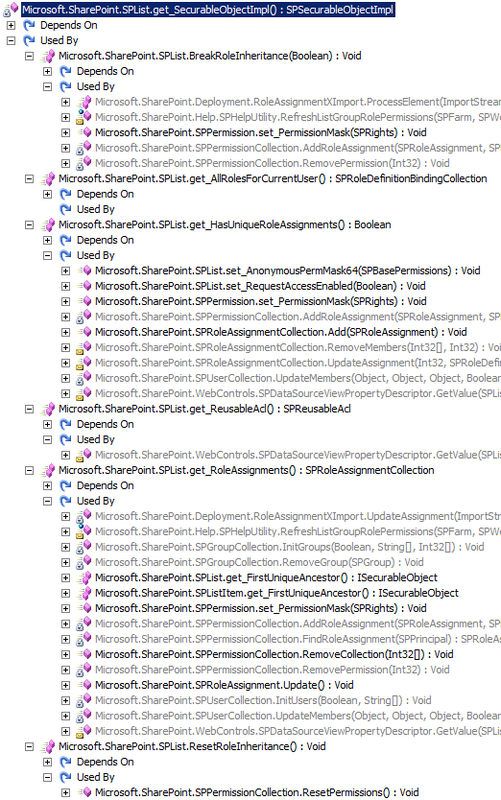 My point is that trying to figure out if SPList.ParentWeb has been referenced is a wasted effort. Assume that ParentWeb is safe enough and if we have memory problems later we can investigate. Assume that ParentWeb is leaky and figure out a safe way to Dispose() it.